Did Luther Really Cause Secularism? The received Western narrative of the Reformation—that it was a key trigger for many of the developments that made the West great (political freedom, modern science, and so on)—has come under increasing criticism in recent years. Much of this criticism reflects the fact that the cogency of the West’s own narrative has in general become far more questionable. The American Way no longer looks like the destiny of the world as a whole, with Russia, China, and Islam each offering alternative visions of modernity. In this context, Notre Dame historian Brad S. Gregory offered a detailed and powerful counter-narrative in his important 2015 book, The Unintended Reformation [read TGC’s review], where he sought to root many of the malaises of Western modernity—especially anarchic moral relativism and the collapse of traditional sources of authority—in the contributions made to Western culture by the 16th-century reformers. In this anniversary year, Gregory has produced a popular version of his earlier work, specifically focused on (though not restricted to) the life and contribution of Martin Luther. 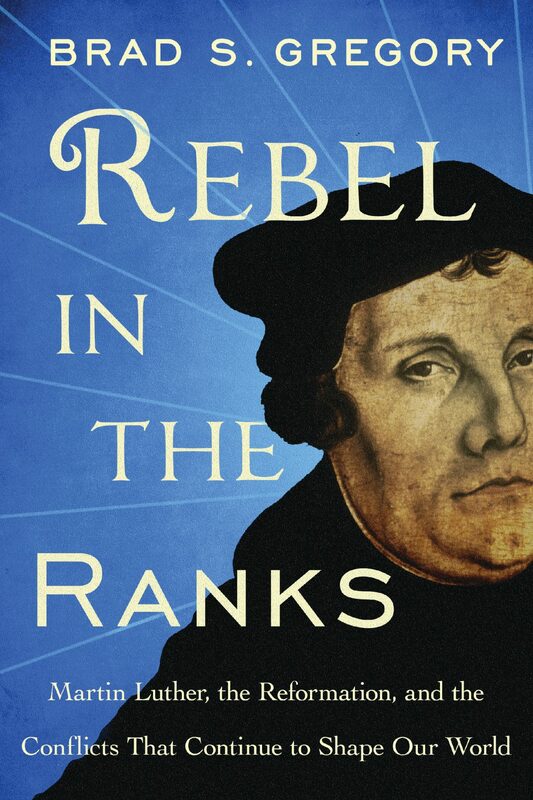 Rebel in the Ranks: Martin Luther, the Reformation, and the Conflicts That Continue to Shape Our World is everything one might expect from Gregory: well-written, thoughtful, at times entertaining, provocative, and (from my perspective) deeply flawed at key points in the argument. The book consist of four chapters. The first three are remarkable, covering the period between Luther’s call for a debate on indulgences to the late 17th century. Along the way, Gregory provides a summary narrative of the key events, personalities, and ideas that shaped the Reformation across Western Europe. This is an impressive achievement. I cannot think of a single volume that covers such a broad historical sweep with such conciseness and clarity. For this reason alone, the book deserves to be read by all who want to grasp the overall shape of the Reformation and be able to set the different places and personalities in relation to each other. The problems really emerge in the final chapter, where Gregory offers his basic thesis: the Reformation was a religious phenomenon that paradoxically led to the secularization of society. Perhaps the most significant problem with Gregory’s thesis is the concept of unintended consequence that undergirds his theory of the Reformation and secularization. This is a concept that is by its very nature extremely elastic. For example, given the way in which Jews were transported to Auschwitz, one could make the case that the Holocaust was an unintended consequence of the invention of the steam locomotive. Does George Stephenson therefore bear responsibility for the Shoah? In a merely technical sense, yes. No means of mass transportation, no means of mass killing. But in a morally significant sense, not at all. Stephenson provided a necessary precondition, but not a sufficient one. Perhaps the most significant problem with [Brad] Gregory’s thesis is the concept of unintended consequence that undergirds his theory of the Reformation and secularization. So how useful is the “unintended consequence” concept when applied to the connection between the reformers and, say, the subjectivity of modern expressive individualism that is tearing down traditional Western morality apace even as I type? If Gregory’s argument is merely to trace narrative connections between one and the other, then yes, it would seem legitimate to press this theme. But the overwhelming tenor of Gregory’s narrative is to press the concept as a means of making the reformers the (albeit unwitting) villains of the story. The concept must then carry a moral weight that its elasticity cannot bear. It also indicates the problem inherent in that perennial challenge for the historian: the narrative’s starting point. Every historical narrative must begin somewhere and, by doing so, somewhat relativize the importance of what happened prior to it. Yet one must be conscious of this potentially distorting factor, and not allow it to exert unduly decisive influence on one’s conclusions. This practice is particularly relevant when it comes to the Reformation. Scholars like Gregory who want to blame the Reformation for the problems that followed will address the problems that beset the church at the start of the 16th century as being merely moral or administrative, not theological. They will then present the Council of Trent as the solution and Protestantism as unnecessary and theologically aberrant. But if you start the history before 1517, this narrative is untenable. HarperCollins (2017). 304 pp. $27.99. How Luther inadvertently fractured the Catholic Church and reconfigured Western civilization is at the heart of renowned historian Brad Gregory’s Rebel in the Ranks. While recasting the portrait of Luther as a deliberate revolutionary, Gregory describes the cultural, political, and intellectual trends that informed him and helped give rise to the Reformation, which led to conflicting interpretations of the Bible, as well as the rise of competing churches, political conflicts, and social upheavals across Europe. Over the next 500 years, as Gregory’s account shows, these conflicts eventually contributed to further epochal changes—from the Enlightenment and self-determination to moral relativism, modern capitalism, and consumerism, and in a cruel twist to Luther’s legacy, the freedom of every man and woman to practice no religion at all. First, it’s well established that Luther’s theology stands in certain continuity with his medieval Occamist training. No Occamism, no Luther. Thus, if secularism is an unintended consequence of Luther, then Luther is just as much the unintended consequence of late-medieval theology. So, if (for the sake of argument) we accept unintended consequences as a helpful category, who is really to blame for secularization? The man from Wittenberg or the faithful sons of the medieval church who taught him? Second, narratives like that offered by Gregory, which blame the reformers for the collapse of the church, are typically predicated on a somewhat romantic view of the Middle Ages and a narrow, rather idealist, understanding of historical change. In fact, the medieval church maintained its unity not because of the magisterium but because of interlocking ecclesiastical, political, and social realities. It was a motley collection of regional churches connected to Rome. It prospered because of its connection to the social and political elite. It was untroubled by the masses for the simple reason that it made little effort to deeply Christianize them, and the masses in return didn’t really care enough to disturb the status quo. As the elements of that arrangement started to break down, problems ensued. And that breakdown had as much to do with shifting power struggles in Europe caused by the rise of commercial trade as anything Luther might do. To this we might add the late 15th-century discovery of a vast, fertile land mass between Europe and China, a discovery that fueled colonial ambition and made naval power, and those with access to it, more significant than ever before. In short, these material conditions meant that the world of the early 16th century was set for a major political transformation, and by virtue of the connection between states and the church, this would inevitably have traumatic ecclesiastical consequences. Luther is not the cause of a crisis in authority but a response to it. Third, to use a specific example, Gregory rightly sees the Leipzig Disputation of 1519 as central to Luther’s development. The brilliance of John Eck in debate forced Luther to concede—and perhaps to realize for the first time—that the matter between them was one of authority. With Luther seeing the papacy and councils as having erred, he was forced back to Scripture alone. But Gregory fails to acknowledge that Luther is responding to the theological significance of historical realities. The late 14th and early 15th century involve multiple simultaneous popes, a matter resolved only by the Council of Constance—an imperial, not ecclesiastical, entity. In other words, one might well see Luther’s move to Scripture as disastrous. But one also needs to remember that that move did not precipitate a crisis in authority. No, it was a response to an already existent crisis in authority. The reality of Constance surely shattered any notions of (to use an anachronistic phrase) an Ultramontane view of the papacy. One can regard Scripture alone as an inadequate basis for rebuilding the faith, but one can hardly blame it for the collapse of church authority. The church had already achieved that at a theological, theoretical level in the early 15th century, albeit in practice it was able to maintain authority after Constance by more political and earthly means. To repeat: Luther is not the cause of a crisis in authority but a response to it. And Trent can then hardly be seen as the solution to a corrupt church simply in matters of practice: the history of the church in the late 14th and early 15th centuries meant that notions of papal and conciliar authority were already deeply problematic at a theological level. One can see Trent as the neat solution only by ignoring the contradictions on which the papacy and Trent by that time rested, or alternatively by historicizing the notion of church authority and making it the product of some nebulous historical process. And what might be the unintended consequences of that last move, one wonders? And yet there is still more to the narrative of secularization that Gregory ignores. Ideas have consequences, yes. But they only have consequences to the extent that social, cultural, economic, and technological conditions make them plausible, practicable, and attractive. And sometimes these material conditions drive ideological change even more than ideas themselves do. Thus, for example, the much-trumpeted chaos unleashed by Luther’s Scripture principle is often seen as the direct result of Protestantism and as leading to the “pervasive interpretive pluralism” at the heart of the modern church’s impotence. But is it? Studies of literacy in South America in the 1960s and a recent UNESCO report have demonstrated that there’s an important connection between rising literacy rates and political self-consciousness. In other words, when a society becomes more literate, the chances greatly increase of significant challenges to established structures of authority, which assume low literacy. That is the world of the 16th century. Luther’s theology was a distinct product of his personality and his own circumstances. But the printing press and the rise of trade and commerce made it certain that the authority structures of the medieval world would be put under severe strain, with or without Luther, Zwingli, and their co-belligerents. Teach people to read, and they’re going to question authority and argue about the meaning of texts. Again, to return to an earlier point: the stability of the medieval church depended on material conditions that were undergoing massive transformation in the late 15th and 16th centuries because of economic changes, voyages of discovery, and the printing press. Regardless of Luther, the medieval papacy couldn’t continue as it had. Change—traumatic change—of some kind was inevitable. Gregory concludes with a lament concerning the election of Donald Trump but, in so doing, points to one further problem in his approach. One cannot lament the things in modernity of which one disapproves without reflecting on their connection to those things we wish to affirm. Democracy always carries the risk of a Trump. But I would rather run that risk than a system that might enable a Kim Jong Un or a Xi Jinping. I would rather know how to read and write and risk pervasive interpretive pluralism than be illiterate. I would rather live in a world of cheap transport, central heating, and antibiotics, even though such a world always risks disenchantment and, even worse, nuclear war and technologically facilitated genocide. But where modernity is concerned, you can’t have the good without always running the risk of the bad. For all of these criticisms, however, I repeat what I said at the start: this is a well-written and provocative book, one that I will be using in class as a way of making students think about the connection between the Reformation and Western modernity. To paraphrase Luther’s comment on Erasmus: the author is to be congratulated for not wasting our time with trivia but putting his finger on the vital point, the hinge on which everything turns. The tale it tells is deeply flawed but perhaps all the more worth reading because of that fact. Did Jan Hus Really Predict the Reformation?